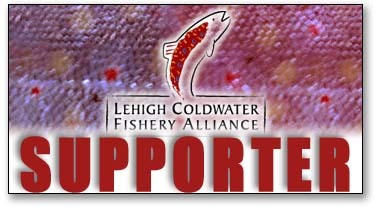 Amazingly we have yet to hit the Lehigh. This is by far the furthest into the season we will have ever been on the river for a season opening outing. And the way things are going with travel and life in general it might not be until mid-June until we hit it. Just unreal. 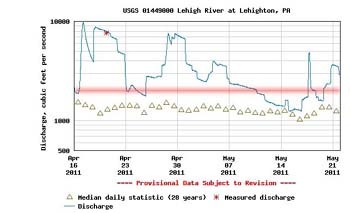 For a frame of reference when floating the Lehigh a 2,000cfs level at Lehighton is the upper most limit for us. As you can see from the chart to the right (2,000cfs is the red line) the Lehigh has been below that level for only a very brief period of time. Unfortunately our schedules did not allow us to get on the water during that small window of opportunity. Lets just hope we don't go into full-on heat mode with hot summer temps. With all this water we've been having it would be nice to season extend well into July. That way we can salvage at least a part of the season. May 20, 2011 - Salt! With the non-stop wet weather, and blown out streams - - a little bit of salt action was the calling for the day. In between dodging the lightning bolts and heavy rain we managed to find our groove and get into a handful of migratories. Both blues and bass.That said, we were really after the weakies. But not to be found; they remain a mystery. Conditions wise - - you could not ask for a better set-up. Incoming tide, heavy overcast skies with rain here and there and very little wind. Now is the time to find a place down along the Jersey shore and get after it. The fish are here! Find some moving water along with a bit of structure and work it. No reason to get more complicated than an intermediate line and a clouser. If the fish are there, they will eat. The weather was perfect. The flows were perfect. The clouds hung close to the ridge tops, there was some rain, and the color of the water was that limestone green we love so much. And let's just say the fishing was fantastic. However, I imagine if you are a dry fly purist you would have been disappointed. But for the nympher like FFPA is, then you could not ask for anything more. With such fine conditions the fish were out of the usual hunkered down spots, and eagerly feeding in all of the depressions that harbored deep enough water to hide them. We are talking bank to bank - that's how spread out the fish were. 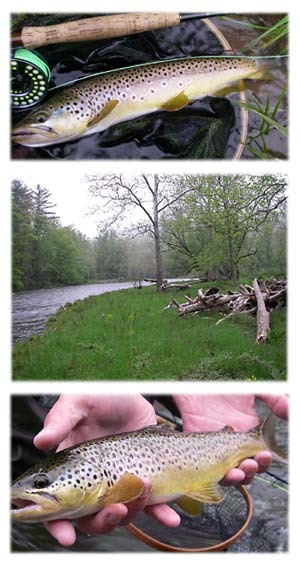 If you are a trout angler these are the conditions and days you remember forever. Overall the fly that produced the best was our march brown nymph. The fish were just all over it. 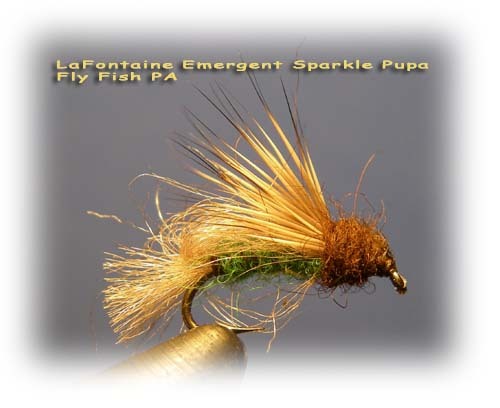 Other patterns that produced were the Lafontaine deep sparkle pupa and the variegated stone. All of which we hi-sticked under an indicator. Though the dry fly activity was limited we did fool a few on march brown emergers and tan x-caddis. Too bad we had to leave and return to the real world, because for the trout angler the conditions could not have been any better. If you can, this is the week to take off work and be a trout bum! The fish have to eat! 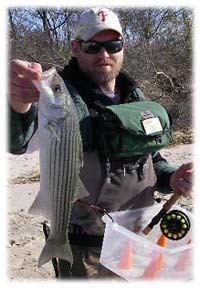 With all the bigger trout waters blown out, and a bit of a case of small stream burn-out setting in, a run down to the NJ shore was in order. No doubt late-April is pushing the season for the shore bound fly rodder, but we've found fish in the past at certain locations. So with the tides being decent, off we went. Conditions were idea. Very little wind and great movement to the water. Anticipation was high due to the conditions being so good, along with the sight of quite a few folks actively fishing when we arrived. Usually that means there is some action going on. So we set-up and started flailing. 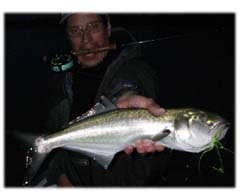 An all yellow clouser was the weapon of choice for the first salt-sesh of the season. It was not too long after, getting dialed-in that a solid hook-up occured. The fish hit very close, so it must have followed the fly quite a distance. It felt like a bass and it was. An April schoolie. We'll take it! Other than that, the hits were few and far between. But one hit was a 'jarring hit!' 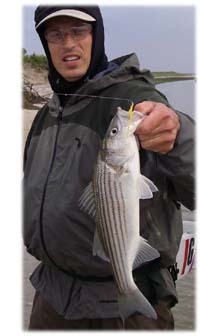 Gotta love the hit of a striper. They are around so get after it!